As a company that has been using Unreal Engine to create AR, VR, and mobile experiences for a wide variety of clients for over four years, Theia Interactive knows a thing or two about data import and preparation. With the advent of Unreal Studio and Datasmith in March 2018, the gap between CAD packages and Unreal Engine was effectively bridged, but there remains a significant amount of work to get architectural and engineering data to be as performant and clean as possible. Fortunately, much of that work is repeatable, lending itself to automation. The technical crew at Theia began compiling the company’s most common optimization workflows into repeatable scripts. 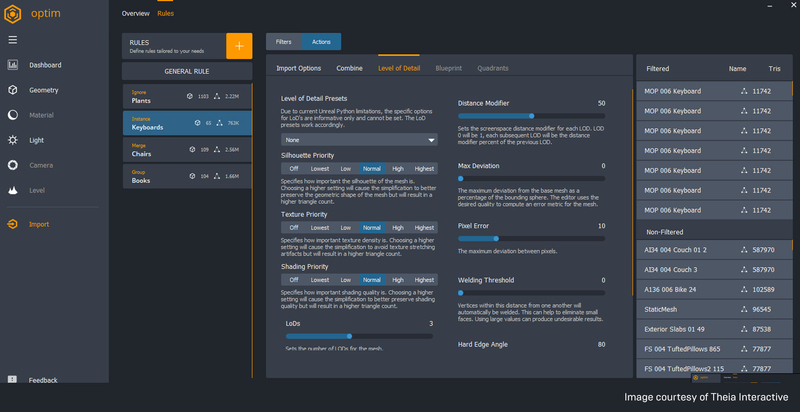 But in order to make them more accessible to the artists and generalists that made up most of their team members, they decided to create a graphical interface that made it easy to assemble these automated tasks based on rules and parameters for any new project—with no coding required. 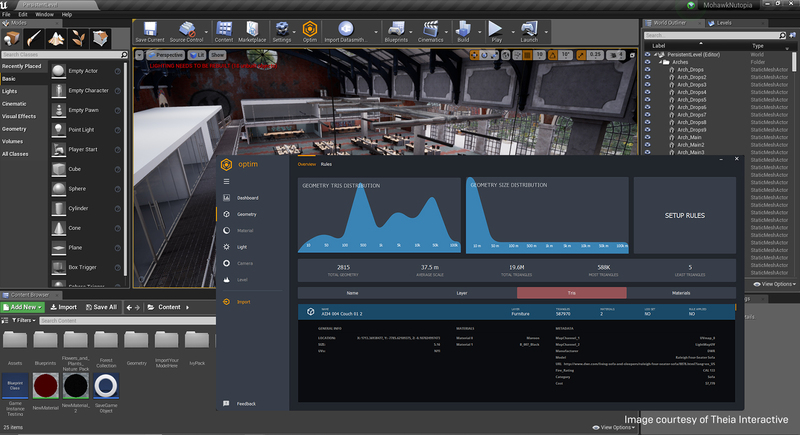 With Optim, you can analyze your Datasmith and CAD files before you import them into Unreal Engine, saving you from having to load the full, heavy level and then hunt through bloated lists of content or complicated 3D scenes for items that require optimizations or edits. You can see the actor list, sort by triangle counts and other metadata, and set up optimization rules based on all these factors. Theia intends to start selling Optim as a subscription in early 2019. But for those who can’t wait to get their hands on it, they’re currently accepting applications for alpha testers at theia.io/optim. 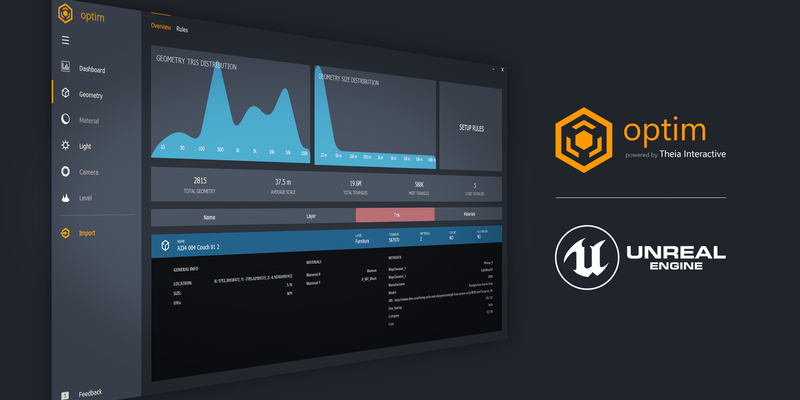 If you’re not already enjoying the advantages of Unreal Studio’s connected workflows and the open platform on which its built, join the free beta today.